(?) Koenecke married Esther Albers, daughter of Albert Lewis Albers and Mathilde Krey. Married Name Her married name was Enge. Edna Albers married Elmer E. Enge. Edna Albers was born on 20 February 1910. She was the daughter of Albert Lewis Albers and Mathilde Krey. Edna Albers died on 6 August 1989 at age 79. Elmer E. Enge married Edna Albers, daughter of Albert Lewis Albers and Mathilde Krey. Elmer E. Enge was born on 16 August 1903. He died on 16 January 1988 at age 84. (?) Rolanda married Gertrude Isabelle Getschman, daughter of Julius Gottlieb Getschman and Lillie H. Kreofsky, after 1938. Married Name 15 January 1948 As of 15 January 1948,her married name was Foster. Margaret June Carpenter was born on 14 February 1932. She married L. J. Foster, son of Ava Jay Foster and Eulala Dell Bond, on 15 January 1948. Margaret June Carpenter died on 4 March 1990 at age 58. Fred Bond Foster married Anne Goldstein. Fred Bond Foster was born on 26 April 1919 at Tipton, Missouri. Fred Bond Foster died on 3 January 1993 at age 73. Name Variation Robert J. Foster was also known as Bobby Jae. Robert J. Foster was born circa 1931 at Missouri. Robert J. Foster died after 1995. Robert J. Foster lived in 1995 at Bunceton, Missouri. Married Name 24 December 1912 As of 24 December 1912,her married name was Weare. Married Name 24 December 1912 As of 24 December 1912,her married name was Wease. Married Name 24 December 1912 As of 24 December 1912,her married name was Weese. Bessie E. Copple was born on 27 February 1889 at Newton, Missouri. 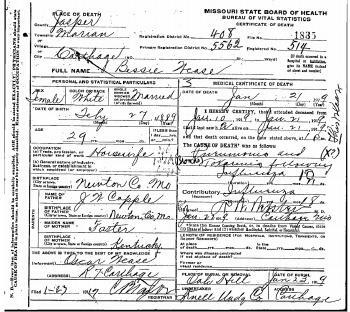 Bessie E. Copple married Oscar Wease on 24 December 1912 at Carthage, Jasper, Missouri. Bessie E. Copple died on 21 January 1919 at Carthage, Jasper, Missouri, at age 29 Death certificate of Bessie (Copple) Wease; from pneumonia and influenza. She was buried on 23 January 1919 at Oak Hill Cemetery, Carthage, Jasper, Missouri. Martha E. (?) married Timothy L. Foster, son of Jackson John Foster and Elizabeth (?). Martha E. (?) was born on 25 February 1856. She died on 22 January 1922 at age 65. She was buried after 22 January 1922 at Diamond Cemetery, Diamond, Newton, Missouri. Joseph McCreery married Mary (?). Joseph McCreery was born circa 1742. Married Name Her married name was McCreery. Mary (?) 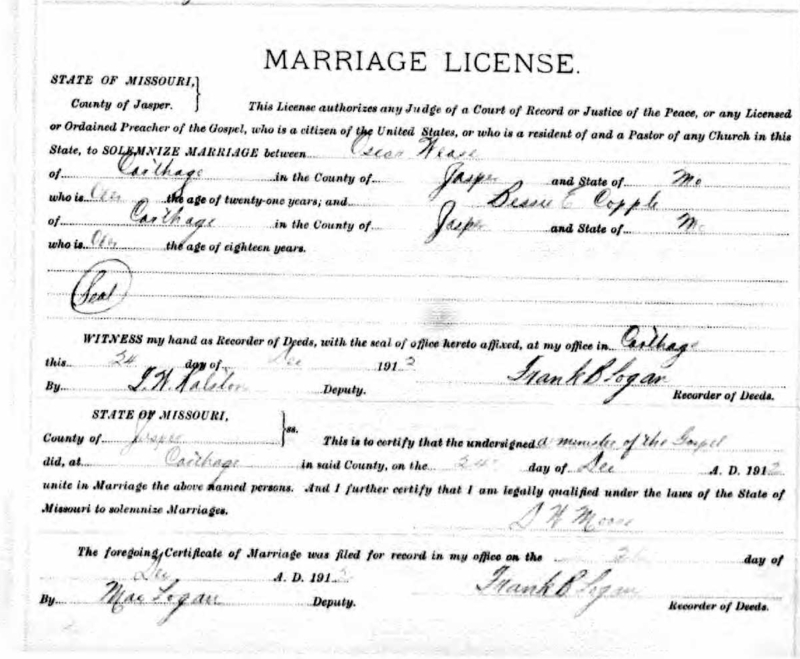 married Joseph McCreery. Mary (?) was born circa 1744. 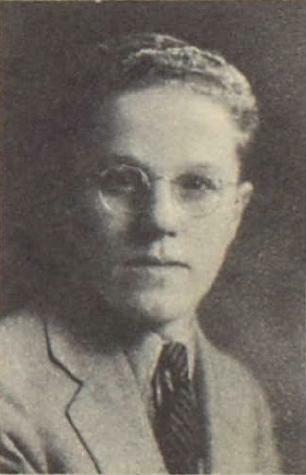 Ferdinand Schmidt was born circa 1911 at Wisconsin. He married Ella M. Wagner on 5 November 1936 at St John Lutheran Church, Reedsburg, Sauk, Wisconsin. Name Variation Walter H. Grosklaus was also known as Raddatz. Walter H. Grosklaus married Caroline Bayles, daughter of John Bayles and Edith Wagner. Walter H. Grosklaus was born on 16 August 1905 at Honey Creek, Sauk, Wisconsin. He was the son of Frank P. Grosklaus and Emelie M. Raddatz. Walter H. Grosklaus died on 10 November 1969 at Collier, Florida, at age 64 heart attack while on vacation. Name Variation Marian June Getschman was also known as Marion. Married Name 9 January 1954 As of 9 January 1954,her married name was Jacobs. Marian June Getschman was born on 10 June 1935 at Baraboo, Sauk, Wisconsin. She was the daughter of Robert Theodore Getschman and Cora Reddeman. Marian June Getschman married Hurley Jacobs on 9 January 1954. Marian June Getschman died on 8 November 2009 at Fitchburg, Dane, Wisconsin, at age 74. Married Name 5 November 1936 As of 5 November 1936,her married name was Schmidt. Ella M. Wagner was born in 1912 at Wisconsin. She married Ferdinand Schmidt on 5 November 1936 at St John Lutheran Church, Reedsburg, Sauk, Wisconsin. Ella M. Wagner died on 14 October 1984 at Sauk, Wisconsin. Paul William Schuette was born on 24 February 1916 at Sauk, Wisconsin. He was the son of Paul Walter Schuette and Martha Emma Vorlop. Paul William Schuette died on 17 June 1996 at age 80. Roger E. Schuette was born on 13 December 1917 at Ableman, Sauk, Wisconsin. Roger E. Schuette died on 16 May 2014 at age 96 Roger E. Schuette, M.M., 96, of Rockford, died at 10:16 p.m. Friday, May 16, 2014, in Fairhaven Christian Retirement Center. Born December 13, 1917, in Ableman, Wis., the son of Paul W. and Martha (Vorlop) Schuette. Graduated from Reedsburg High School in Reedsburg, Wis. and received his B.S. degree in Engineering from the University of Wisconsin. Married May W. Wheeler in Brodhead, Wis., on June 6, 1946; she died March 26, 2005. Roger worked as an engineer for Barber Colman for 42 years, retiring in 1981. He was an active member of Second Congregational Church, where he served as church treasurer for seven years, a board member for five years and volunteered over 1,000 hours installing the new church organ after the fire in 1979. Roger was also a member of Forest Hills Country Club, where he and his wife, May, enjoyed playing golf together for many years. He was a 50 year member of the Masonic Lodge, Freeport Scottish Rite, and 39-year member of the Tebala Shrine Temple. He is survived by many nieces and nephews and several great-nieces and nephews. Predeceased by brothers, Evan and Paul Schuette. Memorial service will be at 2 p.m. Saturday, June 28, 2014, in Second Congregational Chapel, 318 N. Church St., Rockford. Roger E. Schuette graduated in 1935 at Reedsburg High School, Reedsburg, Sauk, Wisconsin. Evan Henry Schuette was born on 12 December 1918 at Ableman, Sauk, Wisconsin. 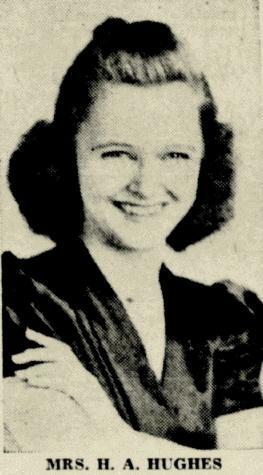 Evan Henry Schuette married Gertrude Elizabeth Hansen on 14 August 1943 at Indiana. Evan Henry Schuette and Gertrude Elizabeth Hansen were divorced in May 1973 at Santa Clara, California. Evan Henry Schuette married Dolores Evelyn Kibbee on 20 May 1984 at Santa Clara, California. Evan Henry Schuette died on 24 June 1998 at age 79. Evan Henry Schuette graduated in 1936 at Reedsburg High School, Reedsburg, Sauk, Wisconsin, and was the senior class president. Harland Robert Klagos was born on 15 November 1933 at Wisconsin. He was the son of Hugo Henry Herman Klagos and Eva F. Retzlaff. Harland Robert Klagos was baptized on 10 December 1933 at St John Lutheran Church, Reedsburg, Sauk, Wisconsin. Married Name before 1910 As of before 1910,her married name was Kallenbach. Married Name circa 1912 As of circa 1912,her married name was Retzlaff. Alma Alzina Schwartz was born on 18 March 1885 at Wisconsin. She married Edward Robert Kallenbach on 2 June 1906 at Milwaukee, Wisconsin. Alma Alzina Schwartz and Edward Robert Kallenbach were divorced before 1910. Alma Alzina Schwartz married Herman Retzlaff, son of Gottfried Retzlaff and Bertha Schneider, circa 1912. 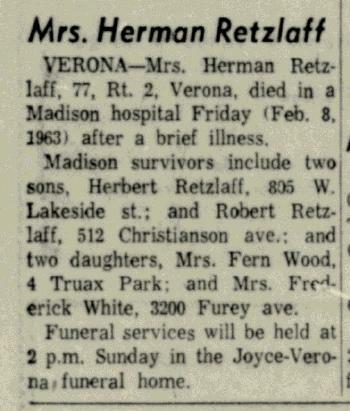 Alma Alzina Schwartz died on 8 February 1963 at Madison, Dane, Wisconsin, at age 77 Mrs Herman Retzlaff (Alma Schwartz) obituary. She was buried after 8 February 1963 at Verona Cemetery, Verona, Dane, Wisconsin. Married Name April 1943 As of April 1943,her married name was Hughes. Married Name before 1963 As of before 1963,her married name was Wood. Married Name 2 July 1966 As of 2 July 1966,her married name was Weigen. Fern Junita Retzlaff was born on 5 February 1924 at Baraboo, Sauk, Wisconsin. She was the daughter of Herman Retzlaff and Alma Alzina Schwartz. Fern Junita Retzlaff married Hugh A. Hughes in April 1943 at The chapel at the Naval Training school, Norman, Oklahoma, Fern Retzlaff and Hugh A Hughes wessing announcement. 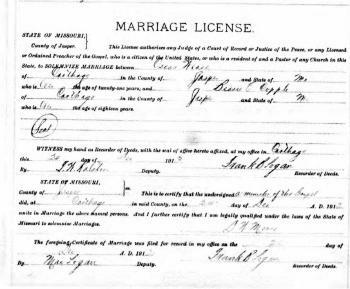 Fern Junita Retzlaff married (?) Wood before 1963. Fern Junita Retzlaff married James Weigen on 2 July 1966 at Sun Prairie, Wisconsin. Fern Junita Retzlaff died on 2 March 2007 at Madison, Dane, Wisconsin, at age 83 Fern J. Weigen, age 83, passed away on Friday, March 2, 2007, at her home at Oakwood Village East, Madison. 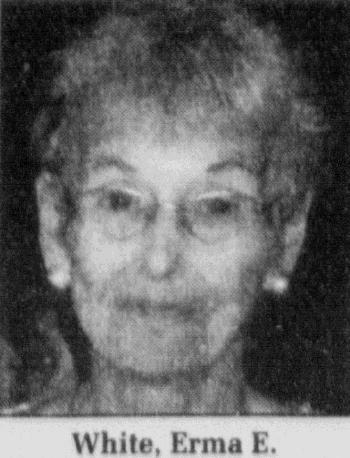 She was born on Feb. 5, 1924, in Baraboo, the daughter of Herman and Alma (Schwartz) Retzlaff. Fern was united in marriage to James Weigen on July 2, 1966, in Sun Prairie and he preceded her in death in 1984. She was a lifelong resident of the Madison/ Sun Prairie area. Mrs. Weigen was employed with the State of Wisconsin for more than 20 years in the Department of Revenue as an audit clerk. She was a member of Bethel Lutheran Church and of the Eastern Star, No. 165 Twilight Chapter, Sun Prairie. She is survived by her sons, Roy (Sue) Hughes of Monona, and Richard (Carolyn Laughter) Wood of Fitchburg; her grandchildren, William Hughes, Kathleen Boyette, Deb Hughes, Craig Wood, Eric Wood and Megan Wood; two great-grandchildren; many nieces and nephews also survive. Besides her husband she was preceded in death by her parents; five brothers; and a sister. A Memorial Service will be held on Saturday, March 10, 2007, at 1 p.m. at the CRESS FUNERAL HOME, 1310 Emerald Terrace, Sun Prairie with the Rev. Byron Bunge officiating, where a reception will follow in the Cress Funeral Home Community Room. A time of gathering will be held from noon until the time of service. Memorial contributions should be directed to the Dane County Humane Society. Cress Funeral & Cremation Service 1310 Emerald Terrace Sun Prairie. James Weigen married Fern Junita Retzlaff, daughter of Herman Retzlaff and Alma Alzina Schwartz, on 2 July 1966 at Sun Prairie, Wisconsin. James Weigen died in 1984. Elmer Rienhold Retzlaff was born on 2 August 1915 at Wonewoc, Juneau, Wisconsin. 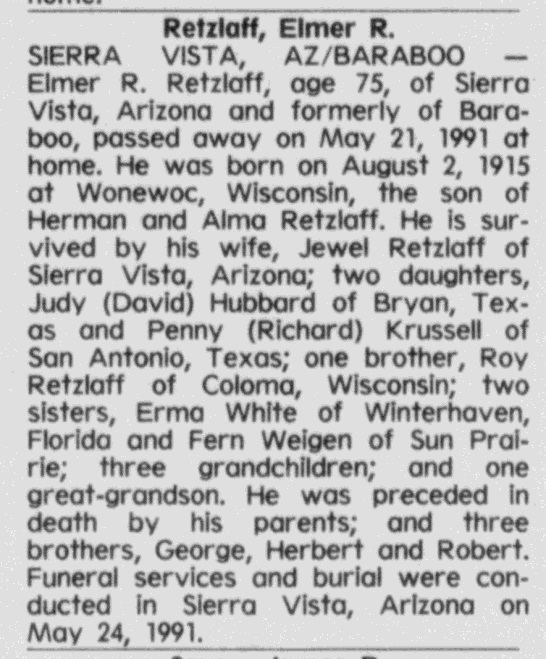 He was the son of Herman Retzlaff and Alma Alzina Schwartz. Elmer Rienhold Retzlaff was baptized on 12 November 1915 at St John Lutheran Church, Reedsburg, Sauk, Wisconsin. He married Jewel White, daughter of Jesse D. White and Grace Floy Clough, on 18 December 1938. 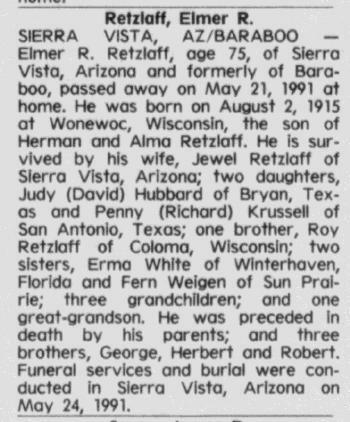 Elmer Rienhold Retzlaff died on 21 May 1991 at Sierra Vista, Arizona, at age 75 Elmer R Retzlaff obituary. Roy Harry Retzlaff was born on 31 December 1918 at Juneau, Wisconsin. 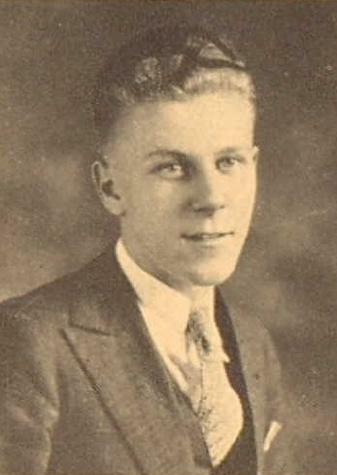 Roy Harry Retzlaff was baptized on 17 February 1919 at St John Lutheran Church, Reedsburg, Sauk, Wisconsin. He died on 30 September 2002 at Monroe, Wisconsin, at age 83. Name Variation Herbert H. Retzlaff was also known as Kallenbach. Herbert H. Retzlaff was born on 16 January 1909. Herbert H. Retzlaff was the best man at the wedding of Irene Pickar and George H. Retzlaff in May 1929 at Sauk City, Sauk, Wisconsin; George Retzlaff and Irene Pickar marriage announcement. 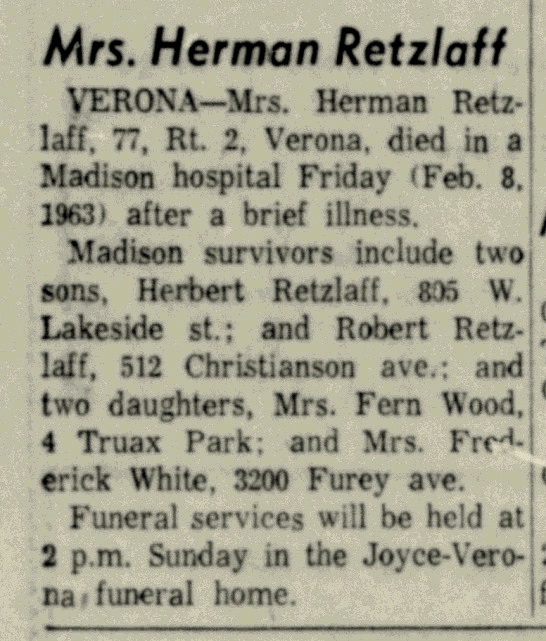 Herbert H. Retzlaff died on 5 April 1973 at Madison, Dane, Wisconsin, at age 64. Name Variation Erma Edna Retzlaff was also known as Irma Edna. Married Name 11 December 1939 As of 11 December 1939,her married name was White. Erma Edna Retzlaff was born on 8 December 1921 at North Freedom, Sauk, Wisconsin. Erma Edna Retzlaff was baptized on 18 January 1922 at St John Lutheran Church, Reedsburg, Sauk, Wisconsin. She married Frederick Henry White on 11 December 1939 at eloped, Iowa. Erma Edna Retzlaff died on 5 February 2003 at Winter Haven, Florida, at age 81 Erma Edna (Retzlaff) White obituary. Name Variation Frederick Henry White was also known as Fred H.
Frederick Henry White was born on 18 June 1918. He married Erma Edna Retzlaff, daughter of Herman Retzlaff and Alma Alzina Schwartz, on 11 December 1939 at eloped, Iowa. Frederick Henry White died on 18 February 2004 at age 85.